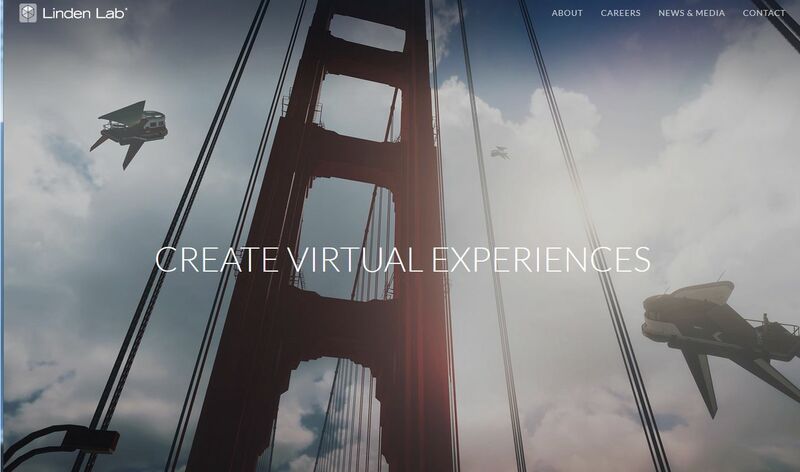 On Wednesday, November 4th, Linden Lab launched a new look to its corporate website. The new design has much in common with other tech-related (and some purely blog) sites, offers a fresh, clean and scrollable home page which introduces the company’s products: Project Sansar (at the rate that name is being used and gaining familiarity, it’s liable to become the de facto name for the new platform! ), Second Life and Blockworld, each with buttons specific to them – the Second Life section, for example will launch secondlife.com. At the bottom of the page is a link to the Lab’s careers page. The home page offers one of two different images at any given time (you might be able to swap between them by clicking). One of these appears to be taken from within “Project Sansar”, showing as it does a model of the Golden Gate Bridge, which the Lab has indicated to be one of the major initial scenes built within that platform. The main pages for the site include a simple, clean menu at the top right, and all have had a similar facelift to the home page, and some nice refinements. The About page, for example, has a much more refined approach to presenting the management team which helps keep the page clean and tidy, although the fact that the images are clickable isn’t entirely clear when hovering the mouse over them. All told, a simple, clean and fast redesign of the website which, to me at least, is a lot more contemporary than previous looks, and which somewhat matches the approach taken with the Second Life landing pages. Looking at the opening image in that clip, both of the home page images are from Sansar.